The traditional cure-all for whatever ails a body is a bowl of chicken soup. How it acquired such status as a great folk remedy is anyone’s guess. The effectiveness of this magical broth in un-stuffing noses has been the subject of great study, and the results are in. According to Dr. Stephen Rennard of the University of Nebraska Medical Center (http://fyinutrition.com/mystery-chicken-noodle-soup), chicken soup’s high levels of zinc and cysteine have anti-inflammatory properties that help reduce phlegm. Its disinfecting, soothing heat can alleviate cold symptoms and speed recovery, and versions including garlic and onion pack a powerful antioxidant-al punch. Who knew that there really is such a thing as Jewish Penicillin? Folks looking to create a made-from-scratch soup stock might turn to Gramma’s recipe of old, but home cooks should not discount utilizing the quality stocks available commercially, which also contain (and may even surpass) the healing potential of the favorite family super soup. The grocery shelves are brimming with options. Where to begin? There are cans, bottles, boxes, and jars— some labeled as stock, others as broth. There are granulated powders, concentrates, and bullion cubes; low fat, low sodium, MSG free; organic, stock made from free-range chickens, stock with wine and seasonings, gluten-free… it boggles the mind. The makers of stocks and broths are obviously keeping up with the latest food trends— even for something as basic as soup stock. The creation of a good stock, according to chef Jacob Brun (Stella Culinary School), is the foundation of all great cuisines. 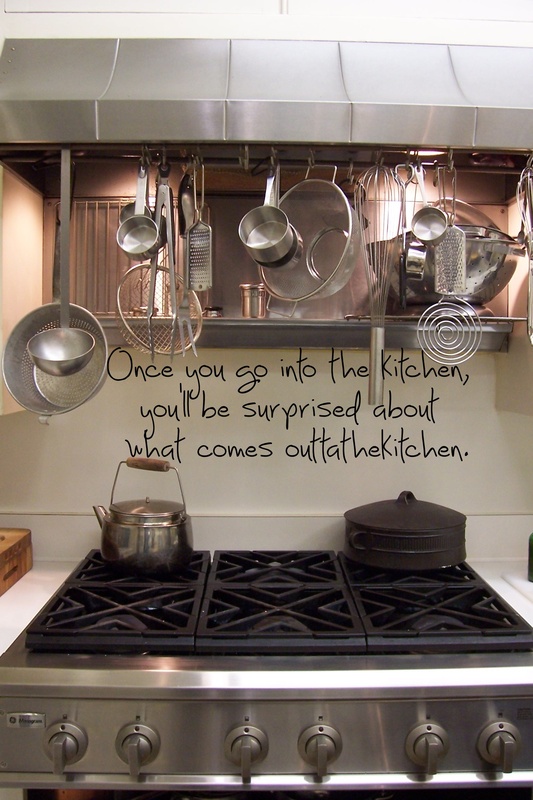 Its role in the kitchen is profound. The art of making a stock lies behind any chef’s mastery of the mother sauces of classical cuisine as they are precise reductions of a quality stock. But what exactly is a stock? And how does it differ from a broth? Many cooks look to richness or thickness as a point of differentiation, with stocks requiring simmering roasted bones to produce a flavorful gelatin. Some identify simmering fresh meat as what renders the lighter broth. Then there are debates about the levels or salt and seasonings. Like much terminology, colloquial usage can confuse the culinary definition. It’s a tedious affair trying to get to the bottom of these differences because, in truth, the differences are not easily standardized. A quick look in the dictionary of the culinary world, Barron’s Food Lover’s Companion, and we find that broth is defined as a liquid resulting from cooking vegetables, meat or fish in water. The term is sometimes used synonymously with bouillon. On the other hand, a stock (from an old German word meaning “root”) is simply a strained broth. In other words, a stock is just a broth until it is strained. As a mere physical, not culinary, refinement of a broth, stock is associated with professional kitchens and serves as as a base for sauce-making or for simmering other ingredients. When my favorite Food Network cooking diva sings the praises of keeping copious amounts of fabulous stock in the freezer for braises, gravies, and soups, I scoff. Sure, I envy the luxury she enjoys every time she pops the lid of one of her quarts of stock kept on hand for cooking up comforting soups or braised shanks, but I know that her home made liquid gold takes pounds of ingredients and hours of simmering, usually in pots the size of the Grand Canyon. Or does it? 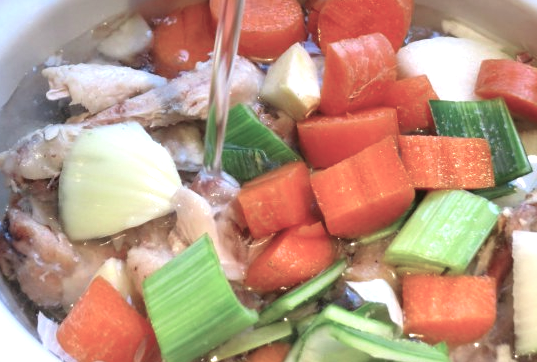 In just a basic home stockpot, cooks can pull off a restaurant grade stock.The basic building blocks are the classical triad of bones, some aromatics (like onions, carrots, celery, and parsley) and water. The formula seems simple enough, and what a great way to use up odds and ends of vegetables or those bone-in meat parts not usually served up as main dishes— chicken necks, backs, and wings, or veal knuckle bones. How difficult can it be to roast the bones and vegetables, cover them in water, and simmer them with a sachet of seasonings (bay leaf, peppercorns, thyme, and garlic)? A little cooling after a 3-4 hour simmer, some skimming of fat, and a thorough straining, and voilá— stock! While many say that homemade stock is much better than anything you can buy in a can or carton, the tongue is the final judge. Yet, many home cooks opt for a commercial brand that delivers a nice umami from its combination of sodium levels, additives, and meat /vegetable/seafood base. Some choose a prepared stock based on label information alone, not taste, and still other cooks select a variety simply because it has absolutely no additives whatsoever. Seeking to control the level of intensity or salinity in their dishes, many cooks enjoy using granulated bouillon, low salt/low fat stocks, or concentrates. When looking for a quality stand-in for homemade stock, you want a clean and savory flavor of meat, seafood, or vegetables, and you don’t want any lingering chemical tastes or anything overly salty. And as for shelf life, prepared stock can’t be beat. Be adventurous in your sampling, and you are certain to find that go-to stock for all your cooking. Though labeled “stock”, these prepared liquids are flavorful factory-made broths designed for the home cook. Unless you are preparing a demi-glace sauce for your master chef class, no worries. Your stock options are plentiful. 1. Combine wings and backbone with onion, carrot, celery, and bay leaf in a large pot with 4 cups of water and turn heat to high. 2. Bring almost to boil, then lower the heat so the so the mixture bubbles very lightly. Cook for 30 minutes, or an hour if you have more time. 3. Cool slightly and strain. Press down the solids to extract as much liquid as possible and discard the solids. 1. Put everything (and I mean everything!) into the insert of a 5 to 7 quart slow cooker and gently stir to combine. Cook on high for 5 hours or low for 9 hours. 2. Pour vegetable stock through a fine-meshed sieve set over a large bowl. If you desire, remove some of the larger chunks of vegetables first and discard them prior to pouring. Skim off any fat that accumulates. 3. In refrigerator, stock will keep for up to five days. In the freezer this will stay fresh up to 6 months.